CARFAX One-Owner. Clean CARFAX. White Frost 2018 Buick Enclave Avenir AWD 9-Speed Automatic 3.6L V6 SIDI VVT 2018 Buick Enclave Avenir in White Frost, Sought After Options Include, **STILL UNDER FACTORY WARRANTY**, ** NON SMOKER **, AWD, 120-Volt Power Outlet, 3rd Row 60/40 Power Fold Split-Bench, 3rd Row All-Weather Floor Mats, 5000lbs Trailering Package, Adaptive suspension, All-Weather Cargo Mat (LPO), All-Weather Floor Mats, Avenir Package, Buick Interior Protection Package (LPO), Front Power Sliding Moonroof, HD Radio, Heated 2nd Row Outboard Seats, Heated Driver & Front Passenger Seats, Heated Steering Wheel, Heavy-Duty Cooling System, Memory Package, Navigation System, Outside Heated Power-Adjustable Mirrors, Power Tilt & Telescopic Steering Column, Ventilated Driver & Front Passenger Seats, Wheels & Front Door Badging, Wireless Charging. **WALT SICARD CERTIFIED! Recent Arrival! ***Our dealership has been providing great customer service in South Haven, MI, near the shores of beautiful Lake Michigan, and Walt Sicard has built a local reputation for high standards in the auto business for thirty years and founded Walt Sicard Car Company in 1995. Known for high quality vehicles and for honesty and integrity in our business practices, we are the recipient of the NIADA Michigan State Quality Dealer Award. We stand behind our vehicles with warranties and a commitment to our customers whether it is before the sale, during the sale, or after the sale. We want to make sure our customers are taken care of and completely satisfied. Each car has a detailed vehicle history in its file to give you the best possible information. We recently have expanded with our new Tire and Service Center. Not only are we running each vehicle we have on our lot through our 88 point inspection but we are now servicing everybody. Come take a look! Please call before you come in to make sure the vehicle is still available. If you are interested in more pictures, just call or email and we will get them right over to you. Established in 1995, we have been in business for over 21 years and are a trusted brand. You will find your experience shopping with us informative and enjoyable. Our cars have to be good, they have my name on them! 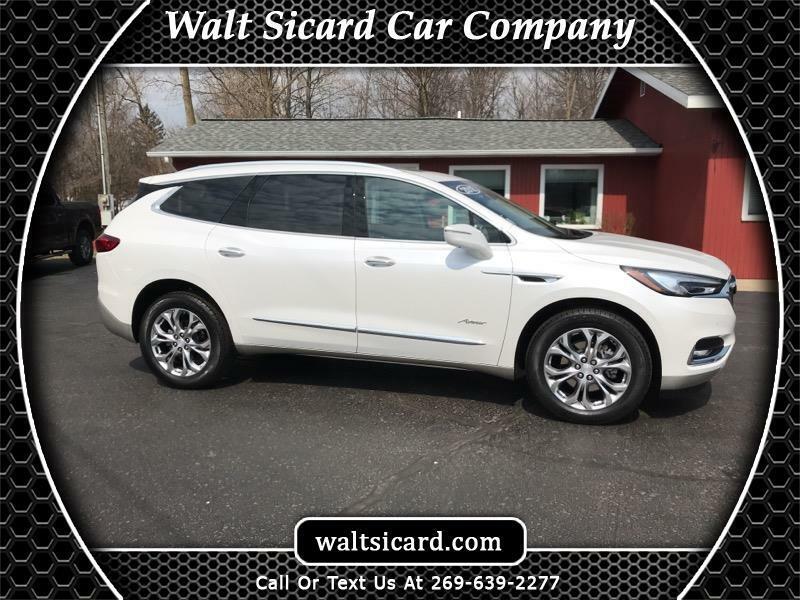 Visit Walt Sicard Car Company online at waltsicard.com to see more pictures of this vehicle or call us at 269-639-2277 today to schedule your test drive. Message: Thought you might be interested in this 2018 Buick Enclave. Prices listed are plus tax, title, license and documentation fees. Prices are subject to change and vehicle availability is on a first come first served basis.